Brazil Converted Its Automobile Fleet to Ethanol In Record Time, Why Can't the U.S.? Simply put, the U.S. has a number of requirements in place that Brazil doesn't. 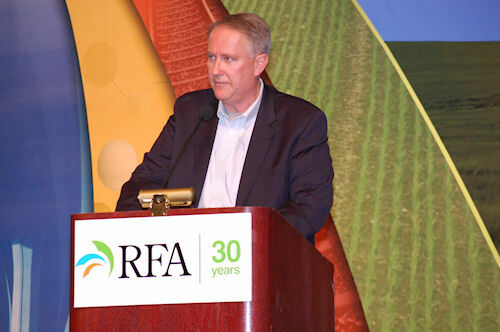 Yesterday, near the end of the 2011 National Ethanol Conference, a member of the audience asked a very insightful question. Essentially, he questioned how Brazil was able to convert its vehicle fleet so quickly to ethanol. Mark Maher, executive director of powertrain and vehicle integration for General Motors, began simply by saying Brazil is not the U.S. From here, he went into the details. First off, Brazil automobiles are not required to have an onboard diagnostic system. In 1996, the OBD-II system was required to be standard on all automobiles sold in the U.S. OBD-II is the system that warns the driver via the dreaded "check engine" light. General Motor's Mark Maher explains the challenges that may exist with older vehicles that were not designed with fuel blends of greater than 10% ethanol. For trained technicians, the OBD-II can save a lot of time when diagnosing problems. According to Maher, the problem is OBD-II systems, especially those in older cars, were designed to be used with 10% ethanol blends and lower. Regulating the fuel mixture becomes a difficult proposition when the ethanol concentration is above 10%. Secondly, Brazil does not have the stringent emission standards that exist in the U.S. Thus, older vehicles may have a tough time maintaining emission standards as the percentage of ethanol increases. Maher adds that Brazil does not have the temperature variances that are so common in the U.S. As the ambient temperature falls, cold starts become more difficult on higher blends of ethanol. Lastly, Paul Argyropoulos, senior policy advisor for the U.S. EPA, says the biggest difference is the consumer. In Brazil, consumers are well versed in what fuel they are putting in the gas tank. Automobiles come with literature explaining the economics of when to purchase E100 vs. gasoline, which in Brazil is classified as a blend of gasoline and up to 26% ethanol.